This story was updated at 9:49 a.m. EDT. Sierra Nevada's Dream Chaser space plane is being developed to take astronauts to and from the International Space Station in low-Earth orbit. The company is aiming to begin full orbital flights in 2016. But the Dream Chaser design, which is reminiscent of NASA's space shuttle, is actually based on a concept vehicle, called HL-20, which was first looked at by the agency in the early 1980s. "We took it out of the NASA attic," Mark Sirangelo, chairman of Sierra Nevada, told reporters this month at the 28th National Space Symposium. "We think, in many ways, it's a terrific story. Not many things that NASA puts away — or really any federal agency puts away for a long time — comes out and gets to see the light of day again and gets to be built. We're pretty proud of that." A commercial space company called SpaceDev announced plans to build the Dream Chaser vehicle in 2004. The company was later acquired by Sierra Nevada, which is celebrating its 25th anniversary this year, and the HL-20 concept became the basis of the vehicle's design. "When we were doing this, the shuttle was still flying — there was not a commercial program with NASA," Sirangelo said. "We were looking at it and saying: at some point in time, the shuttle is going to move on. It's going to come to an end. We looked at it and said, we think there's room in the world for the next generation of what the shuttle could be." Dream Chaser is one of several next generation spacecraft being designed to taxi astronauts to and from the International Space Station. The new vehicles are being built with a combination of private investments and NASA funding, under a program that aims to foster the development of commercial spaceships to take the reins from the agency's recently retired space shuttle fleet. The Dream Chaser vehicle will be able to seat seven passengers, and will function much like its orbiter predecessors. But, the new space plane is being designed to be a more efficient and cost-effective way of reaching low-Earth orbit (LEO), company officials said. "I talk about it a little as being like, you have this major moving truck that takes you from New York to California when you move across the country, bringing all your goods," Sirangelo explained. "Then when you're there, you have a different vehicle. We've built the station now — it's there and it's operational. What we need now is an efficient way to service LEO." The Dream Chaser structural test article at the University of Colorado at Boulder, FAST Lab. Sierra Nevada has already completed a series of crucial milestones in the vehicle's design process, including building an engineering test article, testing the hybrid rocket motors, a round of structural testing, an evaluation of the vehicle's landing gear, and most recently a drop test from a helicopter. The next major drop test is currently scheduled to occur in May, said Jim Voss, Sierra Nevada's vice president of space exploration systems. Voss is a former NASA astronaut and a veteran of five space missions. "We're taking a real flight test approach to this — doing things in an orderly, build up fashion, before we put human beings onboard and go to orbit," Voss said. In September 2011, NASA added four optional milestones to Sierra Nevada's Space Act Agreement, bringing the company's Commercial Crew Development contract up to $105.6 million, pending the successful completion of all the milestones laid out. So far, the Dream Chaser program remains on time and on budget, Sirangelo said. Sierra Nevada has also submitted a proposal for the next round of NASA's commercial crew program. The agency is expected to award the funds to the selected companies in August. An artist's concept of Sierra Nevada's Dream Chaser space plane docking with the International Space Station. 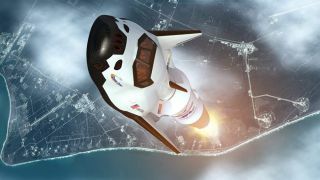 "Many of the systems on the Dream Chaser itself are heritage systems — things that have flown in space or things that have a long history of design into them," Sirangelo said. "While this seems like it's a leading-edge program, in many ways we're trying to be very historical in what we're doing. We're taking the benefit of many years and a lot of hard work by a lot of people and incorporate it in the system." Being a successor to the space shuttle program is also something that Sierra Nevada takes pride in, not just technically, but on a more personal level, Sirangelo added. "In our view, many of the good things in the shuttle are inherent in this design," he said. "And we'd like to think some of the emotion of the shuttle has been passed on to what we're doing, not just in our minds, but in reality." NASA dominated American human spaceflight for more than 50 years, but in the 21st century, private spaceflight companies are building new space taxis to launch more people into orbit. SPACE.com looks at the major players in the commercial spaceflight race in our week-long series: The Private Space Taxi Race. This is Part 3 in that series.